We are increasingly moving towards touchscreen technology. Every new mobile gadget that’s coming to the market has a touchscreen. Most of us interact with touchscreen technology on a daily basis. I’m sure you would have gotten curious some time or the other to know how it actually works. What happens when you touch the screen? How does it know where you touched the screen? All of us deserve to know how it works, especially when we use it so often. Modern technology has always tried to imitate the human sense organs. We have cameras, microphones, smoke detectors, temperature controllers and so on. 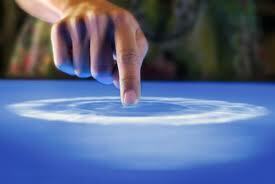 Touchscreen is used to replicate the functionality of human skin. Whenever we touch someone, that person knows exactly where it was. This is particularly useful in naturalizing the interaction between humans and machines. Hence touchscreen technology is used to achieve this. How does it detect your touch? The basic idea is pretty straightforward. Keep the device in one state and change the state whenever there is a touch. There are different technologies which use different properties of materials. The ones that are commonly used are acoustic waves, capacitance, resistance etc. In screens that use acoustic waves, your finger physically blocks or reflects some of the waves. The device will sense that area and sends that signal to the processor. In capacitive touchscreens, your finger changes the amount of charge at the point of contact and this is sensed by the device. In resistive touchscreens, your finger causes layers of circuitry to touch each other, causing a change in the circuit’s resistance. I will limit this discussion to capacitive touchscreens, which are the most popular ones. Capacitive touchscreens are used on some of the most popular smartphones like iPhone, Samsung phones, Motorola phones etc. What is ‘capacitance’ and how does a capacitive touchscreen work? Capacitance is the ability of a body to store electrical charge. For example, we say that copper is a good conductor of electricity. This means that copper doesn’t resist current flowing through it. This property we are talking about is called ‘resistance’. Similarly, ‘capacitance’ is also a property of materials. Any material which has capacitance can be used as an energy storing device. These materials are called capacitive materials. Capacitive touchscreens use a layer of capacitive material to hold electrical charge. Touching the screen at a specific point changes the amount of charge at that point. When a user touches the screen with his or her finger, some of the charge is transferred to that person. Human body is a very good conductor of electricity. Hence the charge on the capacitive layer decreases. This decrease in charge is something measurable by an electronic device. We have now converted a human touch into an electrical signal using capacitive sensors. Can I use anything else other than my fingers? Have you ever tried to touch your smartphone with any other object? If not, give it a try. It will not work! Now why is that? As I mentioned earlier, capacitive touchscreens need the charge to be transferred to the thing that touches the screen. Household objects are made up of materials like plastic, wood etc, which are bad conductors of electricity. This is the reason your touchscreens won’t respond to any other form of stimulus. There are a few devices which come with a stylus, but those are made up of specific type of materials which support touchscreen interaction. Most modern smartphones support multitouch interaction. You can use two fingers to zoom in and out, rotate something and so on. If you just use regular capacitive touchscreens with the same kind of circuitry, your results will go haywire. Regular touchscreens are not expecting changes at two different points on the screen, hence touching the screen at two different points simultaneously will produce bizarre results. Hence they program their sensors, circuits and processors to expect multitouch from the user. This is managed using a coordinate system. Each point on the grid can sense the change and relay it to the processor. Once the multitouch is detected, the gestures are interpreted using machine learning. I have discussed more about machine learning in this blog post. The touchscreen should know what the user wants when he or she bring two fingers closer to each other, or take them further away or just rotate in clockwise direction etc. The algorithm is trained with a large amount of training data to detect these gestures accurately. The accuracy and sensitivity of a touchscreen depends on the quality of the capacitive material used, the precision of the circuitry and the robustness of the algorithm. Hence, some touchscreens are good and some are bad. By the way, did you figure out why the title is ‘touch me not’? If you already didn’t know, ‘touch me not’ is the name of a plant and it has a very interesting property. You can read more about it here. It’s like nature’s own version of touchscreen technology! This entry was posted in Human-Computer Interaction, Machine Learning, Mobile and tagged Pixel, Smartphone, Tablet, Touchscreen by Prateek Joshi. Bookmark the permalink. Of all your posts , i have liked this one the most .